Despite the emergence of new trekking regions and routes around the world, the Annapurnas still has masses to offer the keen trekker and outdoor enthusiast. Whether you’re a first time visitor to Nepal or an inveterate trekker wanting to get off the beaten track, here’s our top 10 reasons why the Annapurnas should always be top of your trekking wishlist. The Annapurna Conservation Area (ACA) was the first protected area in Nepal and is still the largest giving rise to an incredible diversity of landscapes. The foothills offer the quintessential Himalayan scene of lush, fertile terraces set against a picture book backdrop of soaring, snow-capped peaks but trek ever higher and you’ll discover dense bamboo forest, hot springs, sandstone cliffs, mountain lakes, deep gorges and even arid desert dotted with jewel green oases. Simply stunning no matter what trekking trail you are following. With Gentle Trekking in the Annapurna Foothills, the trek into Annapurna Sanctuary, the classic Annapurna Circuit or its shorter counterpart – the Mini Annapurna Circuit, the Annapurnas offer a wide range of treks of varying lengths, altitude and grades. Unlike other parts of Nepal, it has easier paths to suit the novice trekker as well as trails that will appeal to those who regularly head into the mountains. The foothills of the Annapurnas are the heartlands of the Gurkhas; renowned for their bravery as loyal servants of the British Army. The majority of the local people however are farmers due to the fertile nature of the region. The main ethnic group of the region is the Gurungs, but if you’re trekking away from the foothills you will no doubt encounter other groups such as the Manangba and Thakali. Whoever you meet on your travels you can be sure to receive a big smile and warm welcome. The Annapurnas has some impressive natural features including the highest lake and the deepest gorge in Nepal. Tilicho Lake, at nearly 5,000m, is a stunning turquoise body of water that makes for an incredibly picturesque and remote campsite and can be reached on the Naar-Phu & Annapurna Traverse trek. The Kali Gandaki Gorge is not only the deepest in Nepal but one of the deepest on the planet. 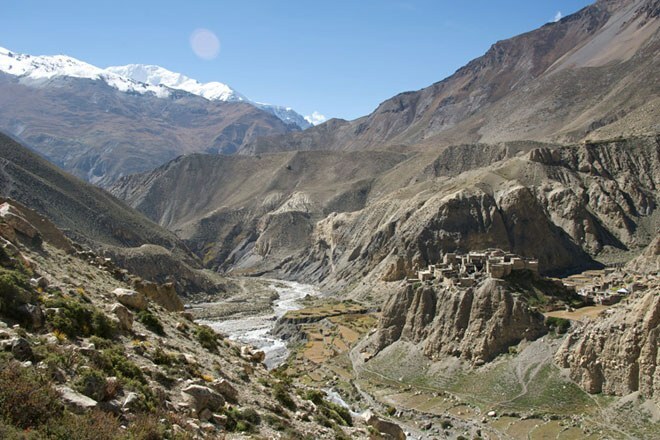 The descent into the Kali Gandaki is one of the highlights of the Annapurna Circuit and is reached via a crossing of the famed Thorong La pass. Not just one, but two of the greatest treks in the world can be completed in the Annapurnas. The Annapurna Sanctuary really is the perfect first Himalayan trek. You’re on trek for only 12 days, the ascents are not too steep, the maximum altitude is relatively kind for the Himalaya and it has a truly spectacular objective – to reach the towering amphitheatre of mountains that forms the Sanctuary itself. If you want something more strenuous that includes 22 days on trek, a spectacular pass over 5,000m, a descent into one of the world's deepest gorges and a daily delight of amazing scenery and breathtaking views, then the Annapurna Circuit is for you. Either will prove to be an unforgettable trekking holiday and the experience of a lifetime. The Annapurna Massif contains some of the highest peaks on the planet - the tallest being Annapurna I at 8,901m. A world of towering, snow-topped giants, there are 13 peaks over 7,000m and a further 16 higher than 6,000m. The Annapurnas are often considered the most beautiful mountain range in Nepal with, perhaps, sacred Machhapuchare the most striking of all due to its steep, thrusting slopes and elegant, fishtail shaped summit. Set foot in the Annapurna Sanctuary and you can see both Machhapuchare and Annapurna I along with Fang, Tent Peak and Hianchuli in one incredible, panoramic view. You don’t have to follow the well-trodden path in the Annapurnas, instead try something a little further afield like the Naar-Phu & Annapurna Traverse and you’ll soon have the trail all to yourself. 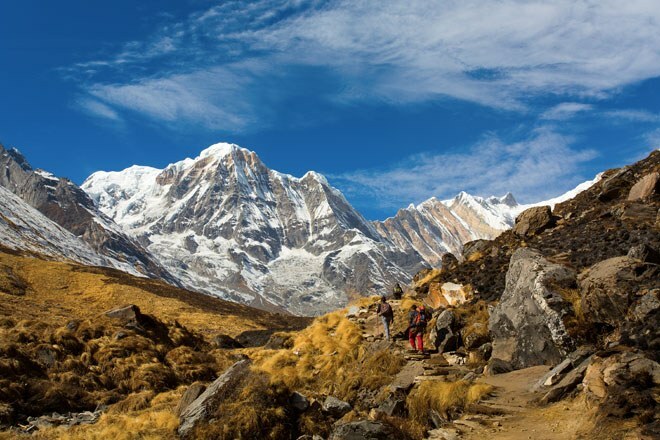 This challenging trek takes you to the Tibetan border at the very edge of the Annapurna Conservation Area, and combines the crossing of two high passes and time at beautiful Tilicho Lake with an exploration of little-visited valleys and isolated communities set amidst spectacular scenery and awe-inspiring landscapes. Chortens, gompas, mani walls and prayer flags are common sights when trekking in the Annapurnas and are all reminders that you are walking through a predominantly Buddhist region. One of the oldest monasteries in the region is found at the village of Braga, but the main cultural attraction is Muktinath temple. Situated on the trekking route of both the Annapurna Circuit and Mini Annapurna Circuit, Muktinath is a key pilgrimage site for both Buddhists and Hindus and you will often see pilgrims there bathing in the temple’s holy waters. 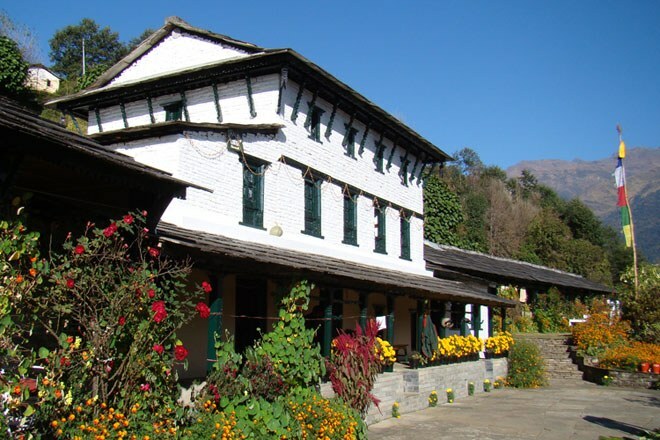 Tea houses are still the most commonly used accommodation in the Annapurnas. 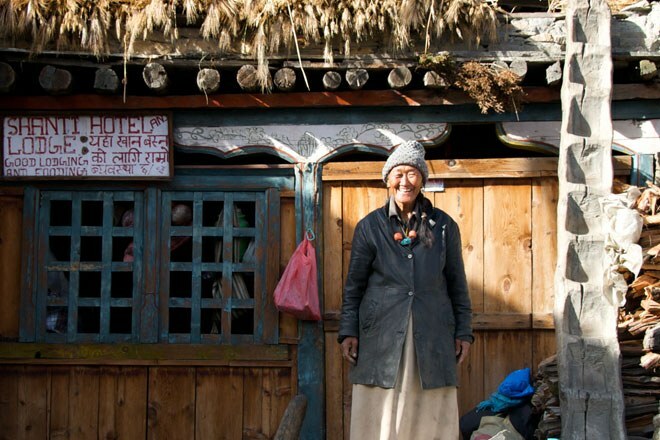 Although basic in their facilities with simple, twin-bedded rooms and communal dining, traditional tea houses nevertheless offer hearty food, a comfy bed and excellent value for trekkers. For those looking to trek in more comfort, there are now several luxury trekking lodges in the foothills of the Annapurnas. Walking between these lodges you can complete our Gentle Trekking, Luxury Lodge trek or, combine them with some of the newer, better-equipped tea houses further up the trail, and you can now reach Annapurna Base Camp in style. 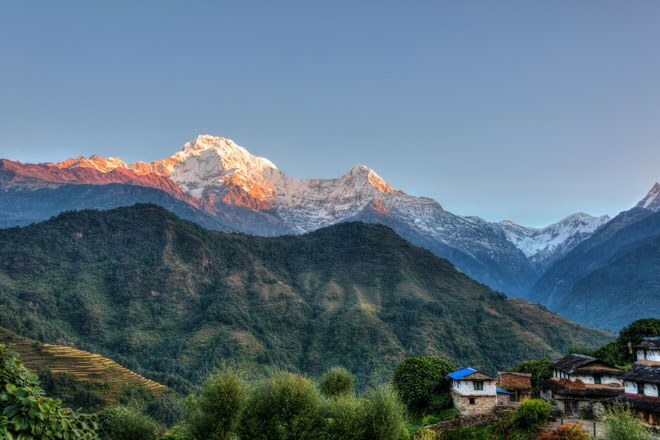 Take a trek in the Annapurnas in the autumn and you won’t be far from orchards full of trees heavily laden with gloriously sweet apples – especially in Marpha the pretty apple capital of Nepal. Eaten on their own they’re a tasty treat or even better in a tempting apple pie which you will no doubt be offered in the tea houses, shops and cafes that line the trail. Better still, share a glass or two of apple brandy with the locals and you’re bound to make new friends. View all our holidays and treks in the Annapurnas or take a look at our Trekking Guide to the Annapurna Region for more information on when to go and how to get there.